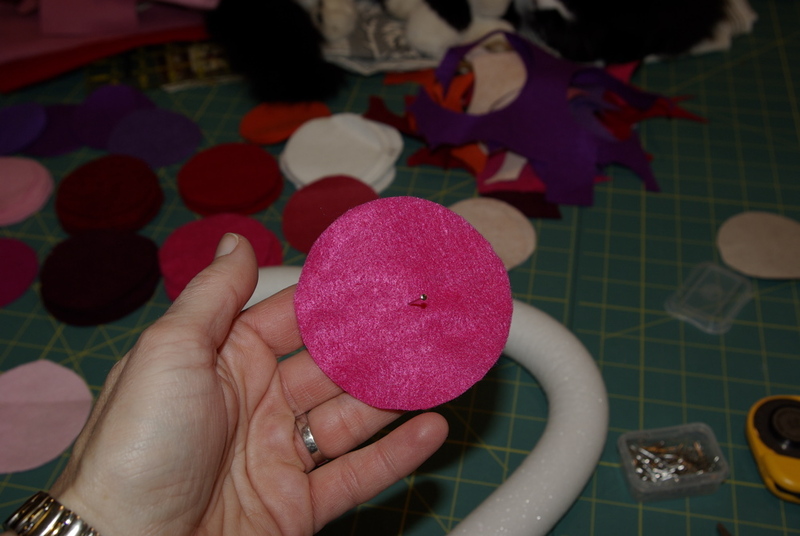 Felt, cut into 3″ diameter circles. I decided to use lots of colors but made up with a single color, the wreath turns out very nice too. About 500 short (1″) straight pins. 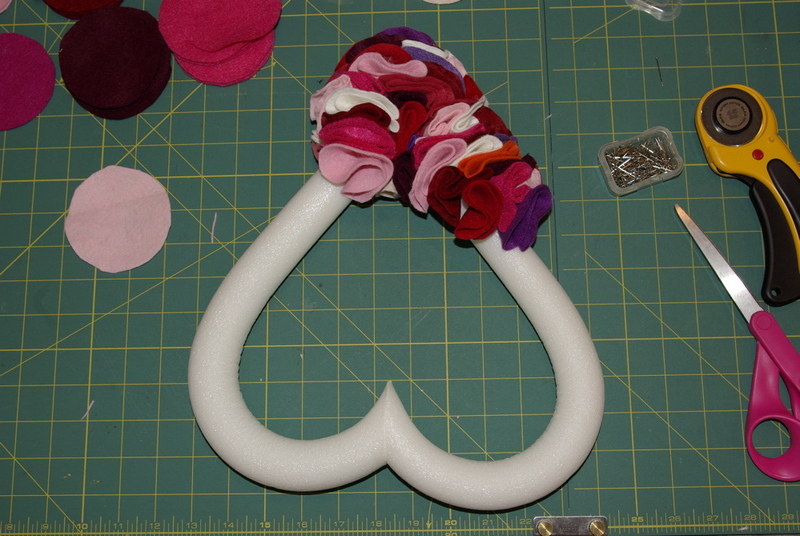 A styrofoam wreath form in the shape of a heart, which can be purchased at any craft store or online. Scissors and/or a rotary cutter for cutting out lots of circles. 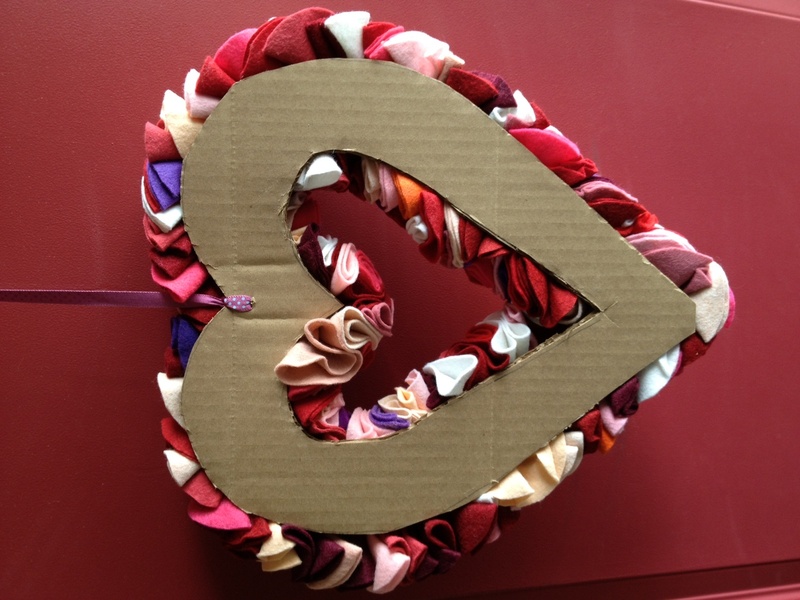 Cardboard, ribbon for hanging (optional). 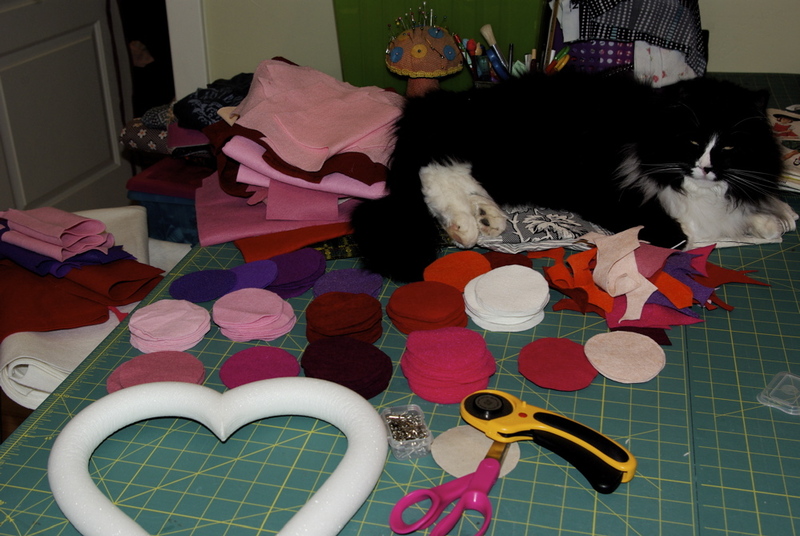 Begin by making a paper circle template and -get comfortable, this could take a while- then cut out about 500 felt circles. The amount shown in the picture is about a quarter of what is really needed. 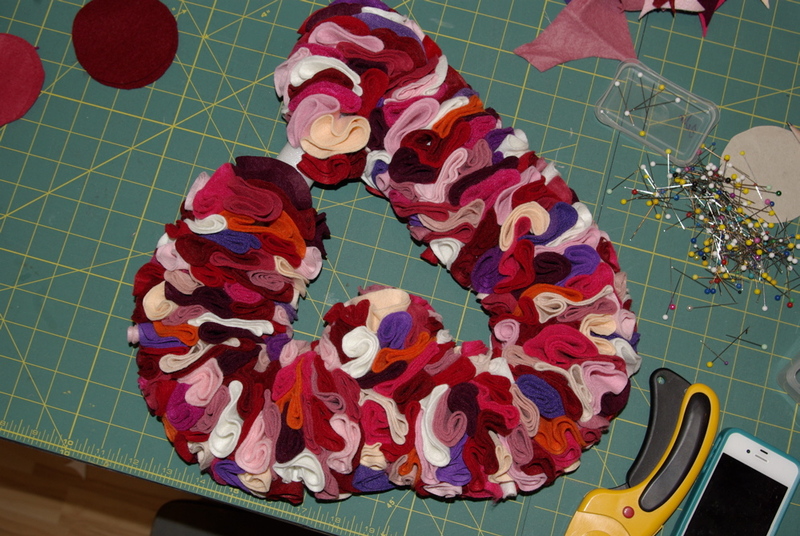 To affix the felt circles to the wreath form, take each piece of felt and stick a pin through the center. 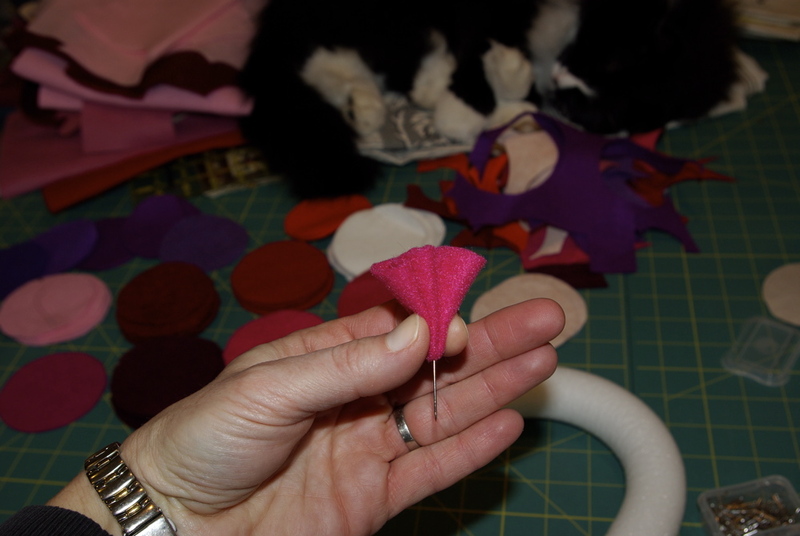 Then fold the felt around the pin, in half, then in half again. You will stick the pin directly into the styrofoam and push it all the way in. Place the pins about a 1/2 an inch apart from each other. 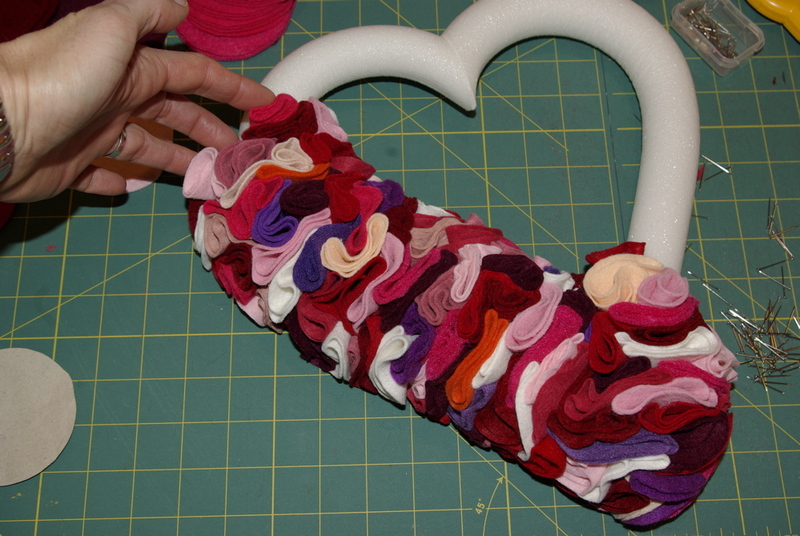 This distance puts the felt folds next to each other without leaving a gap in felt where you can see the styrofoam. I started building at the bottom of the heart. I found it worked best to hold the part you’ve already finished closer to your body and build away from you, adding the folded felt and pin pieces following a grid system. In the picture above, 50 circles have already been used. The felt kind of unfolds if you let it go after pinning so I kept one hand against part I was building onto to keep things nice and tight, and kept on adding circles. Almost done, I did have to stop quite a few times to cut out more circles and when I ran out of shorter pins, I had to dig through the sewing room to look for the next shortest option. The 1 1/2 inch pins with small bead heads worked just fine too. I was worried about the sturdyness of the finished product because the pins go in and come back out quite easily. 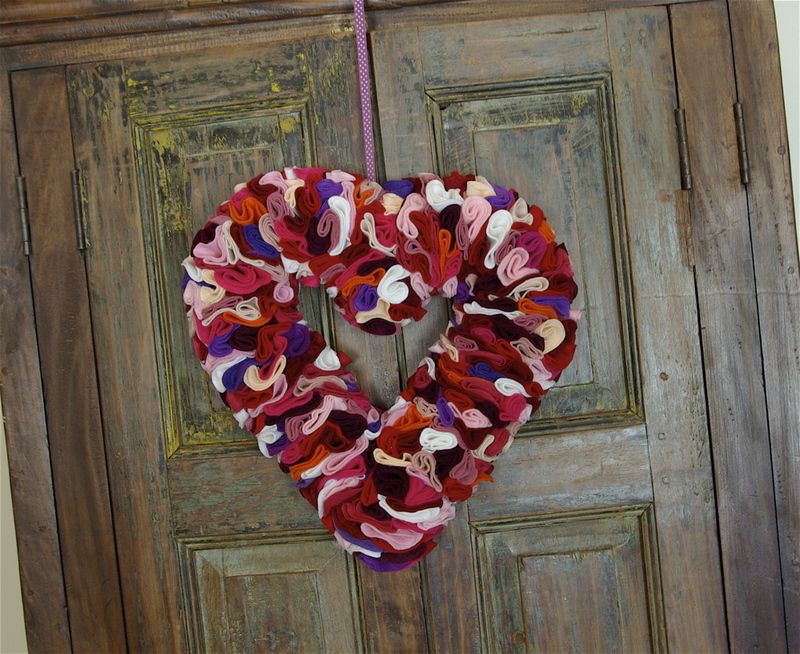 I plan to hang this wreath on my front door that gets a lot of wind, so I added some extra insurance to the back. 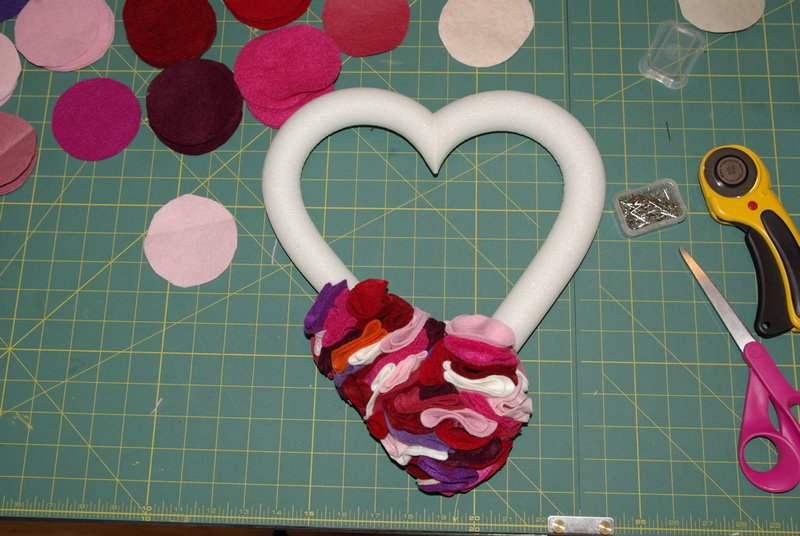 I cut out a piece of cardboard slightly smaller than the finished wreath (by laying the finished wreath on a piece of cardboard and tracing the shape) and hot glued it to the back, making sure to use a lot of glue and hit the styrofoam as well as the felt. I cut a slit in the cardboard and tied a piece of ribbon on for hanging. Hopefully this will make it sturdy and long lasting. Congratulations, you’re finished. Enjoy your gorgeous envy-of-the-neighborhood wreath!